Where did all the hurricanes go? The 2013 Atlantic and East Pacific hurricane seasons left much to be desired, unless you live along the coast, in which case I should say, thankfully! But, what happened? There are a few different ideas floating around, but from what I could assess, it appears that the Atlantic in particular was very hostile this year. There was an abundance of dry air aloft and near the surface due to subsiding air within a large central Atlantic ridge. The dust that made so much news was more due to the larger scale system and wasn’t directly responsible for the total lack of significant activity. So, how has the season looked? The two tracking maps above detail the season through September. The Atlantic has seen 10 tropical storms (before Karen) with two of those becoming Category 1 hurricanes (Humberto and Ingrid). The East Pacific has been slightly more active with 13 tropical storms (before Narda) with six of them becoming hurricanes (nothing above Category 2). The relative quiet is rather unprecedented, but more impressive is the lack of major hurricane landfalls in the U.S. According to Brian McNoldy’s blog, we have gone 2,909 days (as of this post) since the U.S. has been hit by a Category 3 or stronger hurricane. I know, Sandy was wild, but wasn’t technically deemed a hurricane at landfall (though did contain Category 1 winds). When was the last major hurricane landfall? Hurricane Wilma in 2005 (in southwest Florida)! As of this writing, the Atlantic is quiet, but we do have two very powerful tropical cyclones on the globe. Tropical Cyclone Phailin is officially classified at 135 knots (155 mph) in the Bay of Bengal according to the Joint Typhoon Warning Center (JTWC), yet the satellite representation looks stronger yet. The cyclone is forecast to make landfall in eastern India on Saturday as a possible Category 5 cyclone (greater than 156 mph). Ironically, prior to this storm, the North Indian Ocean had been very quiet this year. The other strong tropical cyclone is Typhoon Nari in the West Pacific. The current intensity from JTWC is 100 knots (115 mph or Category 3) and will be making landfall in Luzon, Philippines in the next few hours. It seems all the big storms have been in this basin and that may continue as another storm (Wipha) forms east of Nari and strengthens to a Category 3 typhoon while recurving south and east of Japan. For those interested in weather state-side, the current nor’easter (with some input from what was Tropical Storm Karen) will continue to mill around the Mid-Atlantic for a couple more days. Areas from Richmond up to NYC will see showery conditions the next 24-36 hours, but tapering down to pesky drizzle storms. The winds will also start to relax during this time as the pressure gradient between the storm and strong high pressure over New England weakens. The highest wind gusts along the NJ coast have been around 40-45 mph, while farther south there were gusts approaching 50-55 mph. Coastal flooding will continue to be a threat for a couple more days. The general wet pattern may not be done after this storm, but I’ll try to update later. I’m sure a few of you have heard about the possibility of a Blockbuster East Coast Storm/Hurricane. Well, it’s a bit too early to get excited or hyped up about this scenario, but know that it is not impossible. The culprit here. . .newly named Tropical Storm Sandy. Sandy doesn’t sound like a threatening name to me, but if some of the models are correct. . .look out! Infrared satellite image with the current positions of TS Sandy and TD #19 by the National Hurricane Center. I’m not going to include multiple maps for this upcoming situation as it’s too early yet. I did include the current infrared satellite image with the current positions of Tropical Storm Sandy and Tropical Depression #19 courtesy of the National Hurricane Center. TD19 will stay far from land, although may flirt with hurricane strength at some point during its lifetime. TS Sandy is bound to cause major headaches for forecasters and Emergency Managers as we wait to see how it interacts with an approaching trough from Canada. This trough will have some very cold air for this time of year, so there is plenty of energy on the table, but what will happen? As you can see, I drew three main track philosophies on the map above that represents today’s model solutions. Starting with the arrow that turns right south of Bermuda, that would be the GFS forecast which means nothing for the East Coast and Bermuda would have to be on guard. This possibility is not off the table yet, but I’m a bit skeptical as this model is notorious for recurving storms too fast. The middle arrow is from the European model and would bring a very strong storm, possibly hurricane into New England. This is a bit more likely, but historically, has never happened before. . .to my knowledge. The third track that bends to the left is down-right scary (from the Canadian, Japanese, and earlier runs of the European and GFS) as that would be a very high impact East Coast event. Although I think that is just as unlikely at this point as the recurve towards Bermuda, there is history on Sandy’s side. I included a couple historical tracks below for your amusement. 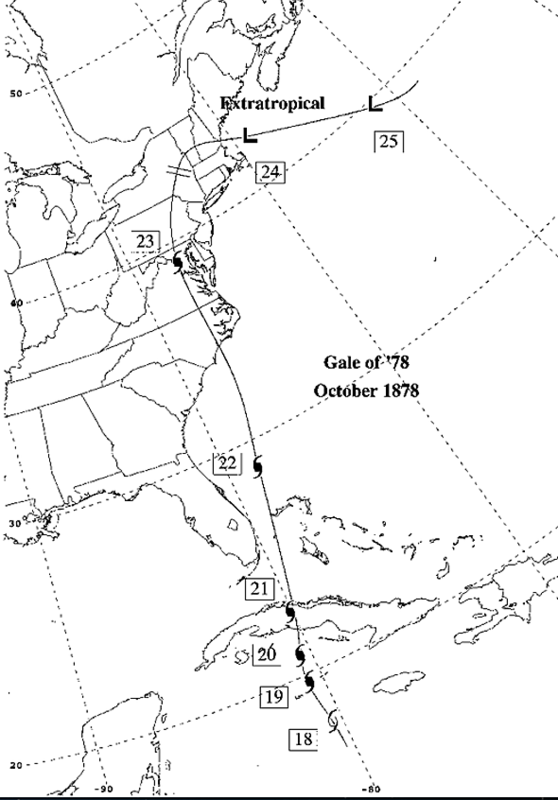 A map of the “Gale of 78” courtesy of David M. Roth and High D. Cobb III from a paper they wrote in 2000. Track of Hurricane Hazel (1954) courtesy of Unisys Weather. As you can see, it has happened before. . . I will have more on this situation as it develops (doesn’t develop) over the next few days. I know that all attention for the next week is going to be on the East Coast and Irene’s eventual impact. I’ll do my best here to clear up any confusion or concern. I will start by saying that even with the shift in track in the models towards the NC/SC border, I still think it’s too early to lock onto this landfall idea. NHC keeps moving the track slowly east and I don’t see the harm in that. 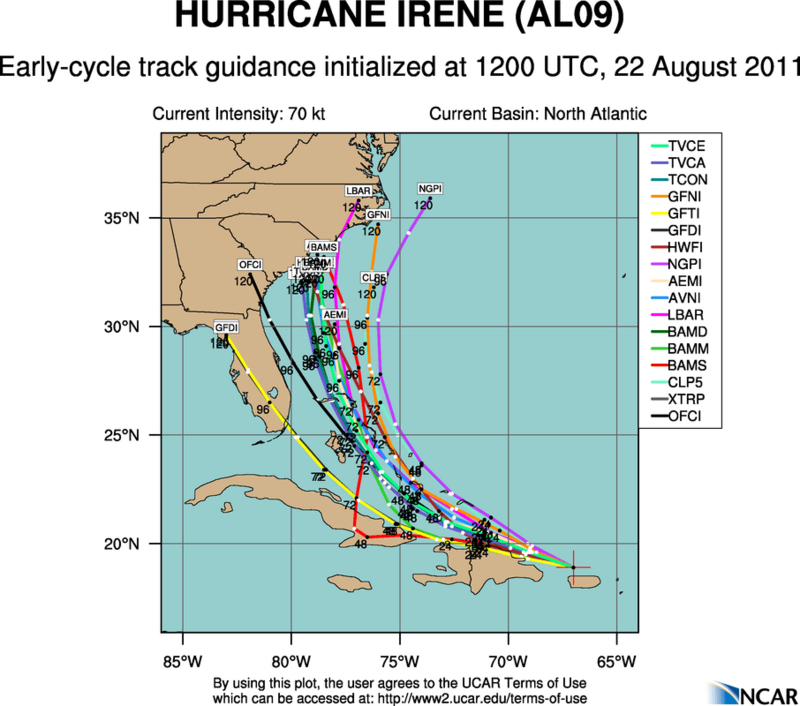 The morning model runs had a significant swing to the east with a couple of the models showing Irene missing the U.S. altogether. I know many would wish for this to happen, but I’m not buying it. . .yet. Over the course of the next few days, I will break down the pattern and how this will lead to the eventual impacts (or non-impacts) of Irene for the East Coast. 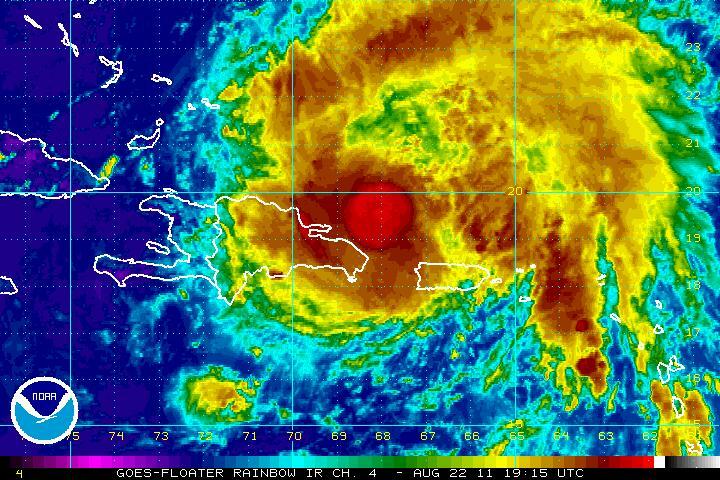 Above is the latest IR satellite image of Irene with a nice, strong convective burst showing up near or just to the north of the eye. An earlier radar image from San Juan shows the eye in the NW (far upper-left) corner of the radar range. After this image, the eyewall looks to have tightened, though the pressure remains around 988 mb and winds around 70 knots (80 mph). Irene should continue to strengthen over the next few days as it should not be hindered much by Hispaniola, though a minor plateau in strength should occur during the next 24 hours until the storm pulls further away from the island. This hinderance would be due to strong downsloping off the high mountains of the island, which acts to dry the atmosphere out. 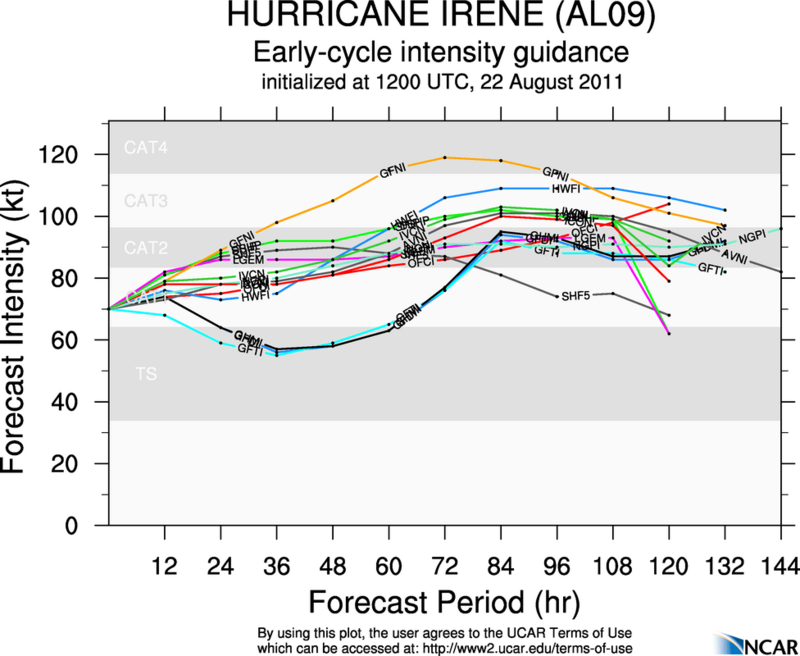 After this point, I see no reason why Irene would not intensify (possibly rapidly) into a Category 3 or 4 hurricane. The 12z track guidance is focused on the northeast SC coast and looking quickly at the 18z guidance, the shift is more towards the Wilmington, NC area. I am leary on believing that right now, but regardless, both the SC and NC coasts look to receive quite a storm towards the weekend. The 12z intensity guidance shows decent agreement on a CAT 2 or 3 storm around landfall. Typically, the models underestimate the intensity, so I would be prepared for something stronger and hope for the best. In my opinion (and I was wrong on the westward track through the Caribbean, mind you) a landfall along the SC coast at CAT 3 strength would be my early forecast. Landfall is still a few days away and much can (and will) change. By the way, the reason my forecast ideas were wrong was because the center of Irene kept jumping north with the convective bursts. . .a further north position meant it was less likely to go through the Caribbean and therefore less likely to affect the Gulf coast. I’m sure many people are happy about this and even FL looks to escape the biggest impacts. Update: I have included the NHC forecast track for Irene (above). Anyone reading this from FL on up to ME should be prepared for very heavy rainfall (especially near the center and just to the west) and strong winds (again, near the center, but more so to the east). This will be a big impact storm, especially for coastal areas. If the storm recurves out to sea, the effects further north will be diminished. My model of choice based on consistency is the European with a 969 mb hurricane (~115 mph winds) making a landfall in northeastern SC. This track would bring the worst conditions to the NC coast. I will update more on effects further north with time. Elsewhere in the tropics. . .98L is still spinning in the middle of nowhere, Atlantic and will be a non-story for a few days. I do think it has a chance to become a tropical cyclone, but it has a hostile environment to overcome. Still, it has some fight to it. Another area of disturbed weather has moved off the African coast and a few models are developing this system in the next 5 days. I mentioned a post or two ago about how hyperactive a start we have had to the 2011 hurricane season. To date, we are tied with 1936 for the earliest 9th storm of the season. 2005 is the only year that was ahead of us with Jose forming by August 22 and Katrina forming on the 23rd. With the possibility that Jose forms in the next 3-5 days, the system after that would be called Katia. I can’t make this stuff up. It’s kind of weird that we are using the 2005 list and we are on pace for 25+ storms. Amazing. Stay tuned for updates and if you have any questions or concerns, please let me know.